Why is there a Beaver on the Oregon State Flag? For that answer and more about the early days the Smith Rock area, come find out Memorial Weekend. The event runs both Saturday and Sunday, May 28 and 29 from 11:00 AM to 5:00 PM. Living history presenters from the High Desert Museum and Ft. Vancouver will be set up near the Welcome Center. 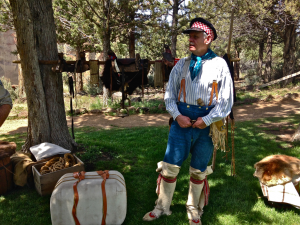 They’ll have displays and discussions about the 1820-1830’s Fur Trade Era which brought Euro-Americans like Peter Ogden through Smith Rock. The event is free, however, you will need to purchase a day use parking pass or display your annual.